In The Other Side of Hope, two very different men are looking for a fresh start. In real life, their chances of crossing paths are near nil, but in writer-director Aki Kaurismäki’s award-winning dry comedy, they don’t just meet but have an unexpected impact on one another. But there’s nothing adorable or convoluted about this collision of worlds. The Other Side of Hope makes room for jokes about bad restaurants alongside stark monologues about the horrors of Syria. It operates in an atmosphere of constant conflicting emotions. Sherwan Haji plays Khaled, a Syrian refugee who snuck onto a barge and now finds himself in Finland. Not knowing a soul, he goes to the Helsinki police to request asylum. Simultaneously, the film introduces us to Wikström (Sakari Kuosmanen), a middle-aged mediocrity who decides to walk out on his life, leave his wife (Kaija Pakarinen) and switch careers. This longtime shirt salesman has a hankering to be a restaurateur, and now he just needs the money and the perfect location to fulfill a belated dream. Those familiar with Kaurismäki’s deadpan style will be unsurprised by The Other Side of Hope’s precise, almost stilted design and acting style. In films like The Man Without a Past, his characters had permanent sighs on their face, as if they knew that this is as good as life is going to get—and it was never that good in the first place. 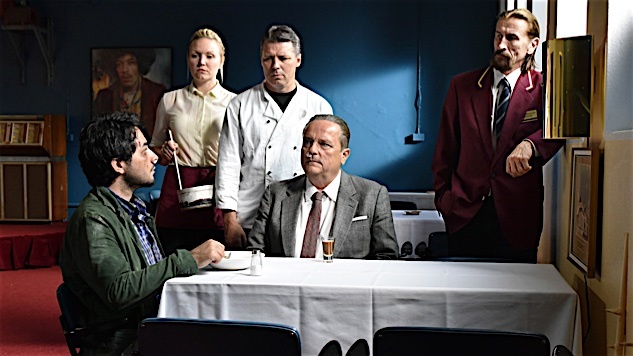 In his new film as well as his last, 2011’s Le Havre, Kaurismäki has focused on the plight of immigrants, which has brought an extra layer of poignancy and absurdity to his movies. He’s a deeply humanist filmmaker who has serious misgivings about his fellow man. His characters might do the right thing, but not without a little prodding. Early on, Khaled tells local law enforcement why he fled Aleppo and what atrocities he witnessed. His fiancée was killed, and during his exodus he and his sister were separated. It’s a horrible story, and Kaurismäki films him flatly in close-up, presenting the tale unadorned. The deceptively unexceptional starkness of the writer-director’s style is striking: The Other Side of Hope never overstates its characters’ emotional states, nor does it go out of its way to underline the contrast in levels of urgency between Khaled’s and Wikström’s dilemmas. A high-stakes poker game in which Wikström bets his life savings in order to buy a restaurant is treated with as much matter-of-fact dispassion as Khaled’s remembrance of Syrian horrors. There’s a sense of modest, almost blasé proportion to everything in The Other Side of Hope. Everyone goes about his business looking out for himself. It’s the way life works, Kaurismäki seems to be suggesting with a resigned shrug. Except, not always, as the filmmaker slowly starts to connect his two seemingly separate storylines. Eventually, Wikström launches his own restaurant, discovering that success does not come easily. (Almost arbitrarily, in a series of amusing scenes, he repeatedly tries radically reinventing the menu. Turns out a new sushi spot isn’t what locals had been craving.) Early in The Other Side of Hope, Khaled and Wikström run into each other—just about literally, as Wikström nearly bowls him over with his car on the first night of his freedom from his marriage and Khaled’s first day in town. Their second meeting occurs much later when Wikström finds Khaled sleeping by the trash, reluctantly giving the guy a job. If they remember each other from the initial encounter, it’s unclear, but soon the restaurant’s and Khaled’s futures are linked. Kaurismäki’s droll comic style remains his trademark and The Other Side of Hope’s strongest feature. With the possible exception of fellow absurdist Roy Andersson, nobody’s movies have quite the same rigorous diorama detachment. But the approach can sometimes diminish the material’s potency. Khaled is tormented by racist bullies, leading to tense showdowns that end up being a tad less explosive than one might expect—Kaurismäki’s restraint can drain scenes of their electricity. As a result, the xenophobia this refugee faces is a little more theatrical and not quite as harrowing as the horrors he would experience in real life. This is not to suggest that Kaurismäki isn’t invested in Khaled’s fate. But he does keep the film’s pulse at his usual cool, subdued pace. Of course, that tonal strategy works quite well as the movie draws to its close and Kaurismäki resolve his characters’ journeys in unexpected, surprisingly touching ways. Neither man is necessarily happier than they were at the beginning. But the resignation with which they accept their respective fates feels appropriate to the film’s moderate emotional gradations. This might be as good as life gets for these characters. But, as both men know, it’s been worse. There’s hope in that.